Alex has been working on his Piper printer idea for a little while, here is his thread. 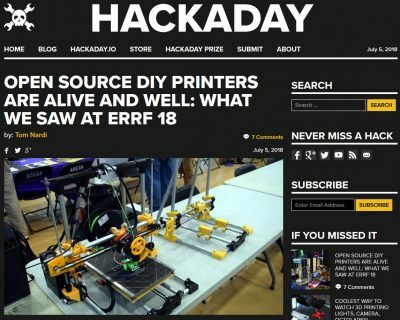 His recent trip to the East Coast Rep Rap Festival with it got him a nice piece on Hackaday. Being partially inspired by the MPCNC it uses conduit and can be made to any size (within reason) that you want. Sound familiar? I freaking love it. The second iteration is already in the works and I can’t wait to see how it all comes together. I met Alex in the first 30 seconds of walking into this years MRRF, (amazing feeling seeing something from the forums and its creator in person). It felt strangely familiar when I saw his Piper on the table, it almost has an MPCNC feel too it with lots of similar shapes and I had seen it somewhere before, and I look up and Alex was full of smiles. After a second I recognized it from the forums. He is very passionate and excited about the project, as he should be, because of that I think his project will progress I am sure it will get more recognition. I am sure we all have plenty of conduit sitting around, so if you want to make a beast for some youngsters to be able to try out, I recommend this one. Alex, thank you for your project and the passion you bring with it. I also greatly appreciate that you always mention the MPCNC, a little nod goes a long way and I appreciate that more than you know.